Pests are a significant problem in the food service industry. Pests can easily drive away business, and also impact food safety by carrying dangerous germs and diseases. Health Inspectors will not hesitate to close any business where they think there may be an infestation problem. Your Matrix Pest Elimination Service Specialist begins with a thorough inspection of your facility to identify any possible infestation, sanitation issues, and pest entry points. Depending on your Restaurant’s infestation issues, we determine the best, quickest, most effective and long lasting course of action to completely rid your restaurant of pest invaders and keep them gone. At Matrix Pest Elimination, we’re experts at solving pest problems for restaurants and other food service businesses. Our advanced formulas and methods are designed to target and eliminate specific types of pests, which means we will ensure that your food facility stays pest free. Our services are backed by the strongest guarantee policy in the industry. 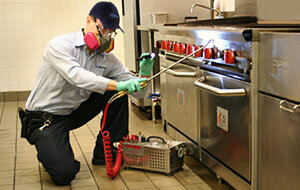 Learn how Matrix can help you keep your restaurant or food service facility pest free. Contact us today for a free consultation.